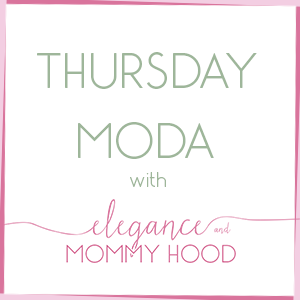 Mom Wear to Work Wear: Camel Laceup Block Sandals (Looks 29 + 30). Good morning everyone. 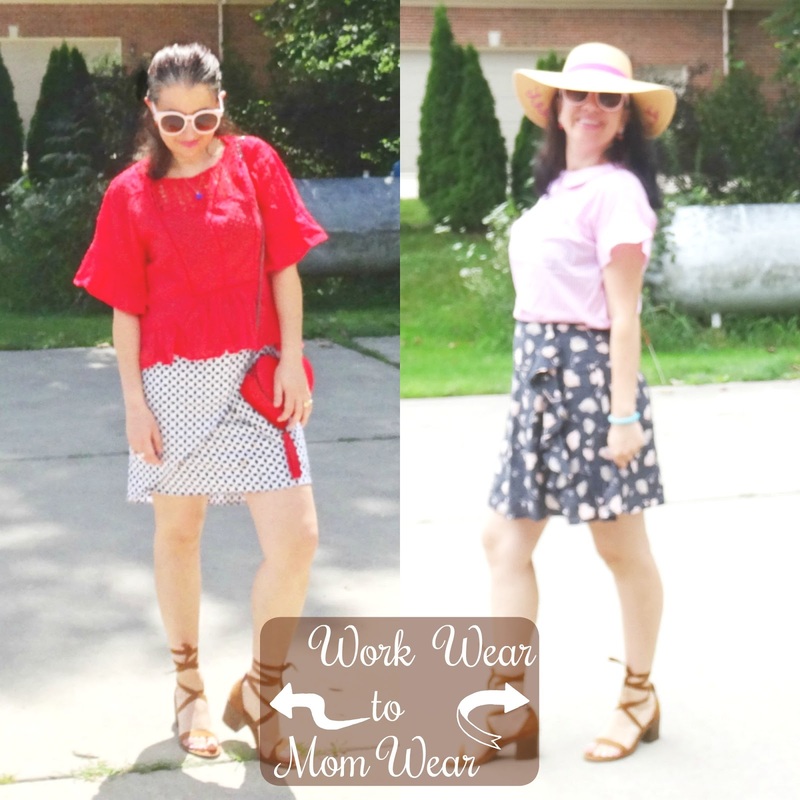 In today's Mom Wear to Work Wear post I took two of the tops and two of the skirts from my Summer capsule and paired them with the same Camel Faux Suede Ghilly Sandals. So my remix item is these Block Heel Sandals and I am here to show you that a ghillie or laceup shoe can be worn to work, too. My jewelry and sunglasses are the same too since those little Red+Silver Crystal Jacket Stud Earrings work great with each outfit. These Camel/Cognac Laceup Block Heel Sandals are currently the top, most-selling item from Target, so reasonable, well-made and so comfy and cute too, plus on trend. Plus, a lot of stylish bloggers own them, too. I have worn them a lot this Summer and might pack them for my vacation, too. I must say I love both of these girly tops. The red one has that beautiful Swiss dot (you can see from the closeup photos) combined with the crochet neckline and also a fun hi-lo peplum, while the pink top is a poplin blouse and it has those white pinstripes and a cute Peter Pan collar which ties in the middle, on the back of the neck as a bow. First of all, excuse my gray roots. 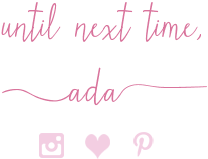 I have needed to get them done like a month ago (sigh) but this mom has been so busy and both times I have tried to make an appointment, my hair-dresser wasn't there and I don't want to change hair-dressers. I am only in my mid 30s but I have had gray hair for about 15 years now. Funny thing is, it is usually just my roots, the crown of my head. They don't grow longer than that and you will see that from the back of my photos as well. Anyway, I will finally get them colored sometime Monday or Tuesday, before we head for vacation. As far as this outfit, once again I paired some red, white and blue so this outfit would be perfect to wear to work around 4th of July or either around Memorial or Labor day. It is not in your face red+white+blue either. I just love the Geo Pattern of this Tulip Pencil Skirt and since it is in white and navy, pairing it with a Red Peplum Top (that has some volume) was a great idea. 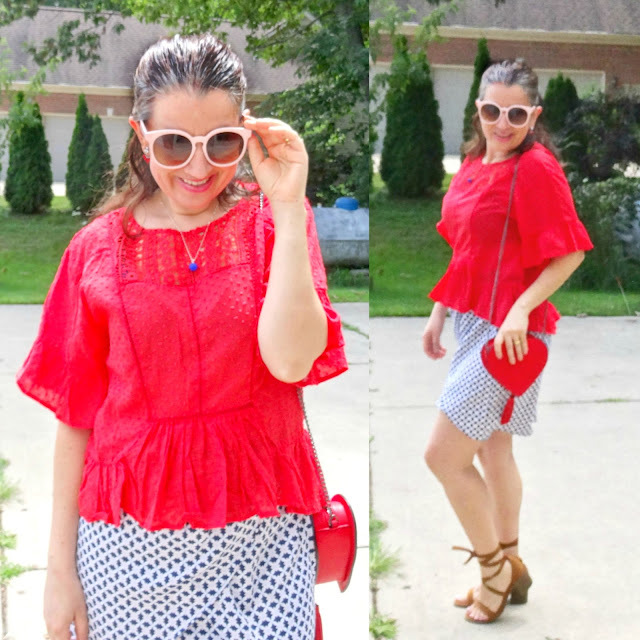 That Gorgeous Red Heart Crossbody Bag matched the red shade of the top. Also, my Jacket Studs are in red+silver - I just got them from Wal Mart and they were about 2 bucks including tax, they are so cute! I am also wearing my Blue Fireball Dainty Necklace that I cannot stop wearing this Summer (because it is so light and blue is a great Summery color). I decided for pink lipstick though so I paired "All Fired Up" with a coat of "Cute Pink 29" on top (you can find them both linked in my widget and I love and recommend both, a lot). I think this is my favorite outfit of the two (despite my gray hair lol), though I do like the more casual mom outfit, too. What about you? Orange-Red Swiss Dot Peplum Blouse w/ Ruffled Sleeves: Knox Rose via Target (very similar, om Sale, my Favorite), (gorgeous option w/ asymmetric hem, Steal, love this), (red striped option, Fantastic Deal, love this), (similar relaxed option, Great Deal). Baby Blue/Navy/White Geo-Print Tulip-Style Wrap Pencil Skirt: H&M (quite similar), (gorgeous option in midi length, Great Deal, my Favorite), (elegant, window-pane option, on Sale, love this), (beige/brown ethno-print mini, Splurge, love this). Light Baby Pink/Dusty Pink Plastic Framed Oversized Sunglasses: Forever 21 (similar, Huge Steal, love these), (similar, Great Deal), (similar, on Sale, my Favorite), (very similar, Huge Splurge, love these). Silver Tone Fan-Shaped Ear Jackets w/ Red+Silver Crystals: Wal Mart (New) (similar w/ silver mini crystals, Huge Steal), (similar gold-tone w/ raspberry red stones, Fantastic Deal, my Favorite), (gorgeous option w/ 3 silver stars, on Sale, love these), (similar in gold w/ green+blue stones, on Sale, love these). 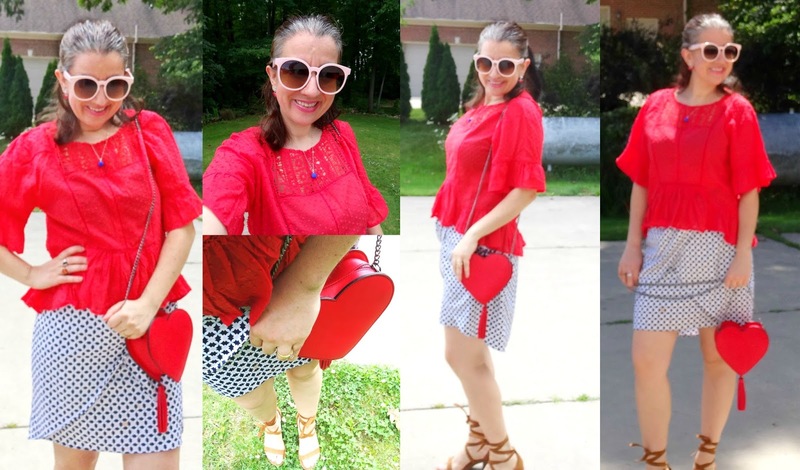 Red, Heart-Shaped, Faux Leather Crossbody Bag w/ Tassel + Chain Strap: Express (New) (identical, Great Deal), (fun patterned option, Huge Steal, love this), (similar in white+blue, on Sale), (fun option w/ red heart pattern, Fantastic Deal, my Favorite). Cognac/Camel Faux Suede Block Heel Ghilly Sandals: Merona via Target (New) (identical + I love them! ), (fun wedge option, Steal, love these), (similar, on Huge Sale), (similar espadrille wedges, on Sale, my Favorite). Fun thing, this hat is my daughter's - well I bought it for her at Gymboree. But it is quite big on her and the benefits of having a small head (in my case) work in my favor since we can take turns wearing this Gorgeous "Life is Sweet" Hat. I have been wanting one of these hats that have fun script messages in the back, for a while now and the saying on this is beautiful, plus it is written in pink and so is that sash. The pink on the hat ties together the outfit since both the skirt and the top have pink in them. And that is why pattern-mixing the pinstripes and the flowers works here. 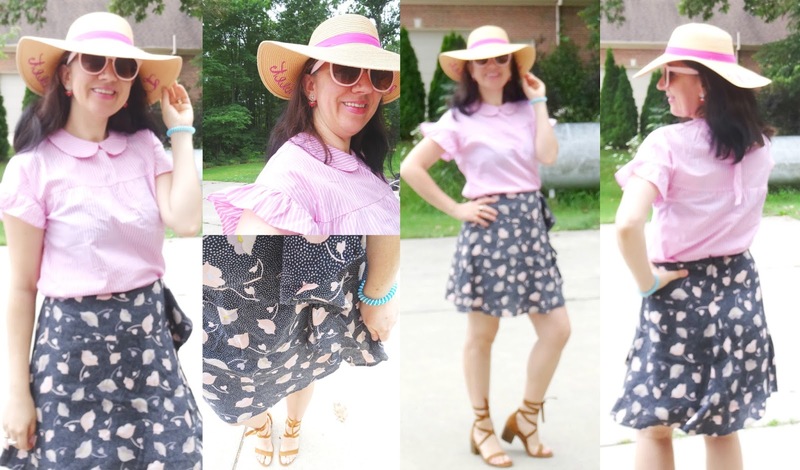 If you stay in the same color theme it is always easier mixing patterns, plus both the stripes on the top and the flowers on the skirt are subtle, not in your face. 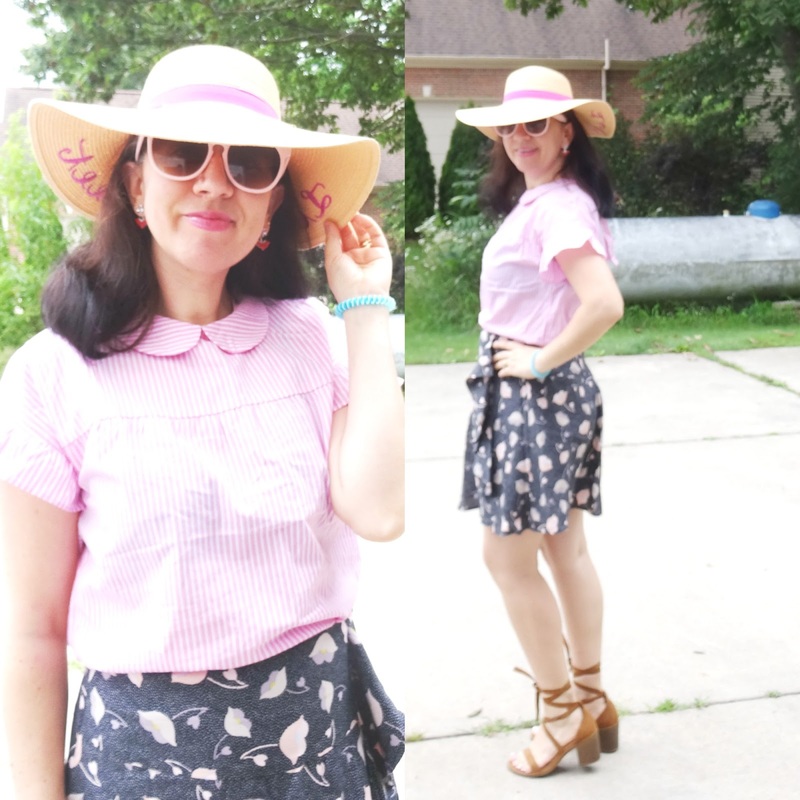 This outfit turned out sweet since the Peter Pan collar and the Floppy Hat combine so well for a girly outfit, further enhanced by the ruffle on that skirt. I can see this working for a shower or weekend brunch, no? These photos are taken just a week ago (mid to late July) but look at all those brown leaves. Come on Fall, it isn't even August yet?! Pale Pink+White Pinstriped Poplin Blouse w/ Ruffled Short Sleeves + Peter Pan Collar: c/o SheIn (New) (identical for a Huge Steal! comes in several prints; I want the pale blue gingham one! ), (very similar as a dress, Steal, love this), (similar, on Sale, my Favorite), (similar, Small Splurge). Gray Ruffle Front Skirt w/ Lavender/Blush Petunia Flowers: Loft (similar in white w/ pink flowers, Steal, love this), (similar in black w/ lavender flowers, Steal), (similar, Great Deal, love this), (similar ruched option, Small Splurge, my Favorite). Neutral Woven Floppy Hat w/ Light Pink Chiffon Bow: Gifted from my Brother (quite similar w/ black bow, Huge Steal, love this), (similar, Steal, my Favorite), (similar, love this), (similar, love this).